The Dalai Lama, (c) AP. In the course of reading ancient philosophy, it is difficult to ignore Buddhism. And in the course of reading about Buddhism, it is difficult not to become at least somewhat familiar with the Dalai Lama. In this case, the 14th Dalai Lama, Tenzin Gyatso. For those unfamiliar, there are various branches of Buddhism (what Westerners might call denominations), such as Mahayana, Theravada, and Tibetan Buddhism. 'Dalai Lama' is a high-priest-like position within Tibetan Buddhism, but he appears to be highly respected by all Buddhists and in the case of this man, even many non-Buddhists. Tenzin was designated to become the next Dalai Lama in Tibet at age two. At age 15 (in 1950) the army of communist China invaded Tibet. He officially became Dalai Lama one month later, but fled into India in 1959 when it seemed the Chinese were about to kill him after a failed uprising. In India he established a government-in-exile which is now run by an elected parliament. Tibet has yet to receive independence and the Chinese today critically dismiss descriptions as I've given here, saying it is impossible to "invade" a region that had long belonged to them, as they claim to be the case. Today China censors any information about resistance or freedom for Tibet and about the Dalai Lama which they do not control. Meanwhile Chinese government policies dilute Tibetan culture and they commonly infringe on Tibetan religious activities and try to have influence over who becomes the next Dalai Lama and other Lama placements. Much to the Chinese government's chagrin, the Dalai Lama continues to be welcome in meetings with world leaders as he advocates for Tibetan rights. Most of the world seems to favor Tibetan independence, though China is a powerful nation with a huge economy and nuclear weaponry, so there is little that can be done to force their hand, other than change from within. Tibetan Buddhism is among the more mystical or supernatural varieties of Buddhism in my view. I tend more toward Theravada, with a few Mahayana elements, but mainly on secular philosophic Buddhism (which appears to be the original Buddhism). For instance, the Tibetan Buddhists believe that the Dalai Lama is really the same entity and that all prior Dalai Lamas have been reincarnations of the first. As for the Dalai Lama himself, Tibetan rights are not his only focus. He continues to serve as a spiritual guide for people everywhere, even beyond Buddhists. He is astute to the differences of belief among different people. When he speaks or writes to Buddhists his subjects will veer into the more esoteric but when speaking to non-Buddhists, he knows how to focus on those elements of Buddhism to which everyone everyone can relate. He does not encourage people to leave their current belief systems to become Buddhists, but seeks to help people everywhere with messages that will benefit them. I have read a few of his books (such as The Art of Happiness and The Universe in a Single Atom) and have to say, they have contained some of the wisest words I have ever read. His teachings are highly practical and aware of the realities of life and the world, and very applicable. Reading this man's writing or seeing him speak, his authenticity, honesty, integrity, compassion, and intellect are obvious. Humanists value education and philosophic study. If you consider the upbringing of a Dalai Lama, it seems education has been intense and varied. The environment in which such a person is raised is essentially a perfectly crafted kiln in which to produce a wise person. He's obviously received a well rounded education that is multicultural and global in scope - a virtual Renaissance man. Along with that he's been raised with intense training in philosophic wisdom, empathy, and compassion. If we could manage to give every person that kind of attention and upbringing, such a society might begin to approach a humanistic utopia. In that regard, a few aspects aside, the Dalai Lama comes close to a Humanist paragon. That's not to mention the values he promotes, which are humanistic at their core. 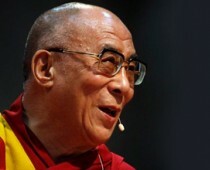 The Dalai Lama is now 75 years old, and it will be a sad day when we must say goodbye to him. His mark will be felt a long time after his passing, but for today we are fortunate to have such a figure as a contemporary.